We had three exhibitions connected with the Sydney symposium in 2015. These exhibitions were open to the general public. The Presentation and Awards Night for the Exhibition took place on Friday 21 August from 6 -8pm for delegates of the Symposium and ticket holders. This is unthemed. 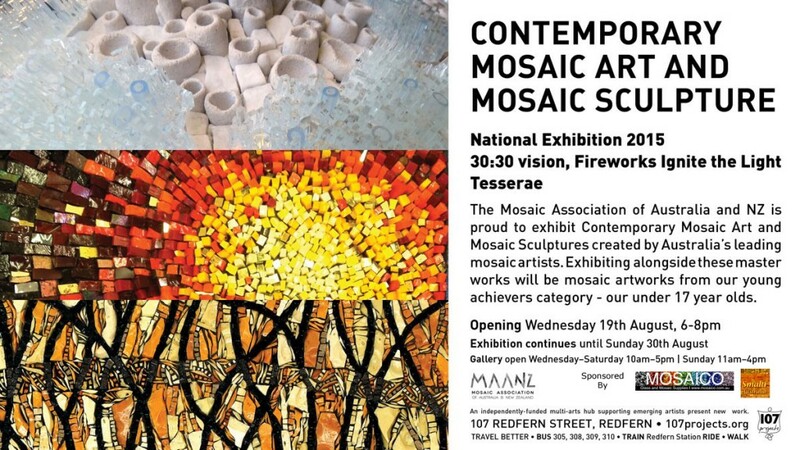 This juried exhibition is the main event including mosaic wall hangings and sculptures. See the exhibition here. For children 17 years and under – encouraging our next generation of mosaic artists. See the exhibition here. These are all works made in a format of 30cm x 30cm. Open to all and the only themed exhibition. See the exhibition here. All three exhibitions will be displayed at 107 Projects Gallery, 107 Redfern Street, Redfern NSW 2016, 35mins walk from City Tattersalls Club, the symposium venue.